Home-cooked dinners happen at my house at least 5 nights a week. And like most of you with busy lives, families, and a traffic-filled drive home I have about 30 minutes to prepare a meal. Any longer than that and I can’t keep keep the train moving toward bath, pjs, teeth brushing, story time, and a consistent bedtime for Eva. Although I have an immense love of cooking, my goals for a weeknight meal have nothing to do with fancy or gourmet. My requirements are quick, tasty, healthy, and balanced. Hopefully it’s something my kid and husband will enjoy and hopefully it’s a little different than the dinner I served the night before. This is the time of year to buy tomatoes. Especially late-summer, bite-sized, sun-baked, candy-sweet cherry tomatoes. Yellow, orange, red — they are perfect to pop into salads, put into your kid’s lunch box, or toss with olive oil/balsamic vinegar/sliced avocado and serve alongside two fried eggs for breakfast. Store them on the counter, not in the fridge. Here’s the meal I put together last night that hit all the above requirements. I served it with Zoodle (Zucchini Noodle) Salad and rice. 2) Lay parchment paper on baking sheet. 3) Spread out cherry tomatoes on top of parchment paper (paper keeps them from sticking to baking sheet). If the tomatoes are kind of big, slice them in half. 4) Pour olive oil on top of tomatoes, sprinkle with sea salt, toss with tomatoes. Put into oven for 15 minutes, stirring halfway through. They should be slightly caramelized, a little gushy, but not burned. 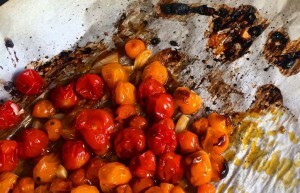 5) While the tomatoes are roasting put one clove chopped garlic, 5 basil leaves chopped, a tablespoon of capers, and three anchovies chopped into a bowl. PS. The anchovies give this dish an awesome flavor pop. Your kids will never notice and your food won’t taste like anchovies, promise. I buy the anchovies that come in a jar with olive oil and keep in the fridge so I can grab a few and use as needed. Same with the capers. If you just can’t go there, this meal would be equally great and healthy without the anchovies and capers. Carry on. 6) When the tomatoes come out of the oven, gently mix them into the above mentioned bowl. 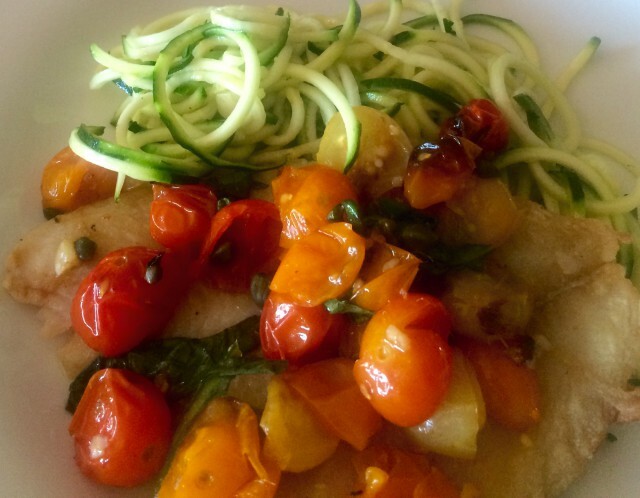 Other fish you could use instead of petrale sole (I get mine at Whole Foods): dover sole (same cooking method as below just a little less cooking time), salmon (eliminate flour, longer cooking time), shrimp (keep tossing around as it cooks, about 4 minutes), cod (a little longer cooking time). Would also work as a topping for roast chicken or sautéed chicken breast. 1) One pound of wild fresh petrale sole (about 5-6 pieces depending on the size). — see note about other fish options above. 2) Salt, pepper, and dust each piece lightly with flour on both sides (feel free to use gluten free flour, or no flour at all. The flour helps the fish not stick as much to the pan but it’s not completely necessary). 3) Heat up sauté pan to to medium heat, add a little olive oil and a tablespoon of butter or ghee. 4) Add fish. Cook for about 3 minutes per side until cooked through. 5) Top with tomato mixture above.